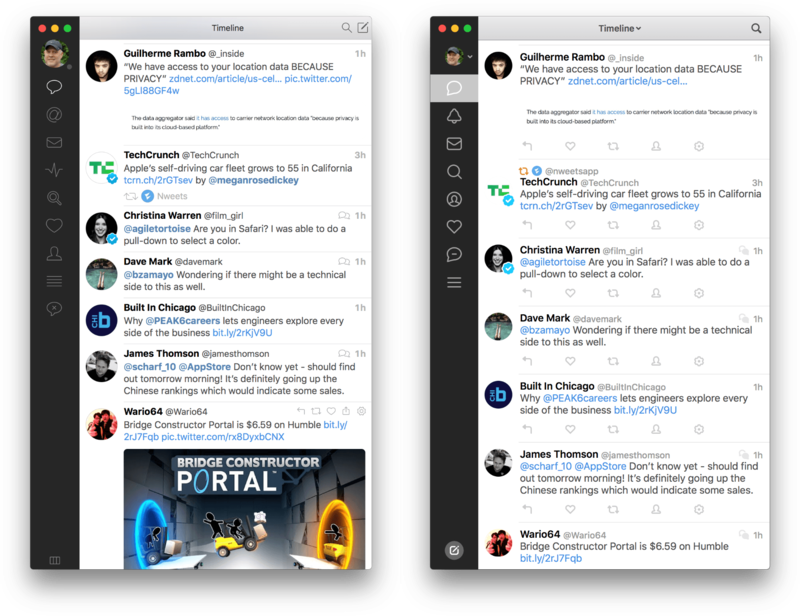 Although Tweetbot 3.0 retains the basic look and feel of its predecessor, nearly every interface element of the app has been adjusted in some manner. Starting with the timeline view, the compose button has been moved to the bottom left-hand corner of the window, replacing the multi-column button. Previously, it was in the top right-hand corner next to the search button, which made it easy to click search inadvertently when you meant to compose a tweet and vice versa. Individual tweets have a different look too. Media included in quoted tweets is more prominent, retweet information has been moved to the top of a tweet, and tweet details show whether the person tweeting follows you. However, the most noticeable change is the dedicated row of light gray buttons along the bottom of each tweet for replying, liking, retweeting or quote-tweeting, and performing account or tweet actions. Previously, a tweet’s buttons were only visible if a tweet was selected or moused over. The last two buttons in the row consolidate account and tweet-related actions found in a variety of places in Tweetbot 2.5. The button with the silhouette of a person accesses the same sort of actions you could previously find by right-clicking on a user’s avatar or visiting their profile page: public reply, Add/Remove from Lists, Disable Retweets, Enable Notification, Open Profile in Safari, Unfollow, Mute for 24 Hours, Block User, and Block and Report for Spam. Tweetbot 3 (right) has share extension support via each tweet's gear button. The button with the gear icon includes the same tweet actions as the older version with the addition of the ability to open a tweet in Safari, Open Link/Media, and Share. Opening a tweet in Safari is handy for voting in polls, for example, which you can’t do in third-party Twitter clients, but I don’t understand the purpose of Open Link/Media, which requires an extra click compared to simply following a link in the body of a tweet, especially since the action only opens the last link in a tweet. My favorite addition to Tweetbot is the Share action, which accesses Mac app extensions making it simple to send a tweet's link to other apps like Things, DEVONthink, Notes, or any other app you have installed that accepts URLs. The row of buttons at the bottom of each tweet means fewer tweets fit vertically into Tweetbot’s window, but that can be mitigated by more font size options and the ability to hide media previews.1 Another new preference is an option to auto-play videos that appear in your timeline. 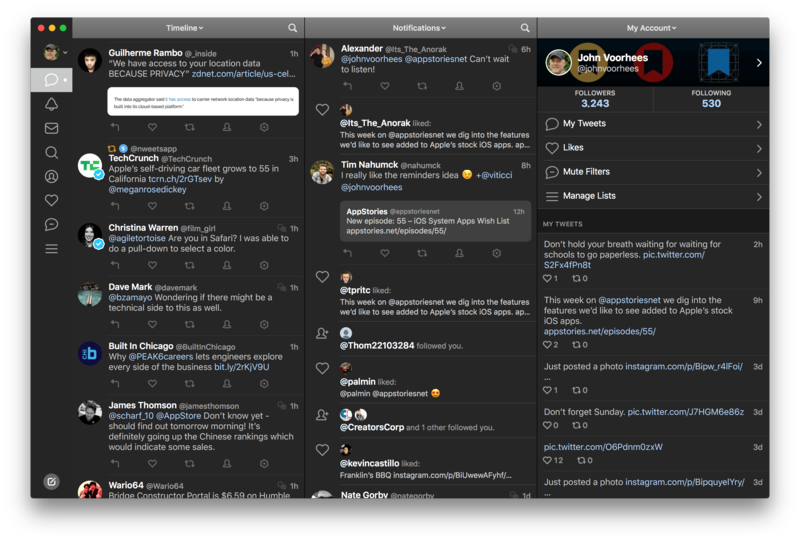 Tweetbot 3 also debuts a new dark mode that sets the background of displayed tweets to dark gray. The other change to Tweetbot you’ll notice right away is that the sidebar for navigating different sections has been rearranged. The changes go deeper than a simple reordering though. Coupled with a drop-down navigation menu at the top of Tweetbot’s window, the update makes navigating Tweetbot easier than ever. Tweetbot 3 adds title bar navigation within sidebar sections. 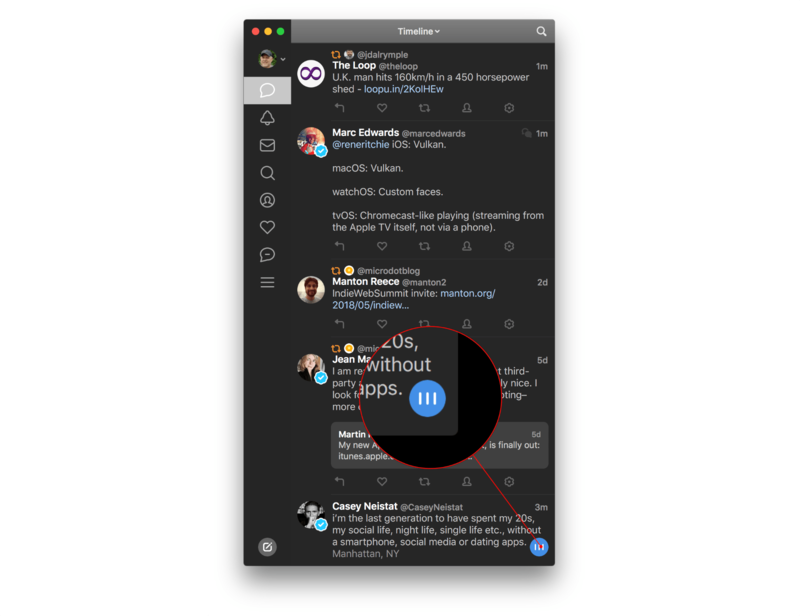 Timeline navigation has not changed, but right below that is a new bell icon for Notifications, which includes what were separate Mentions and Activity sections. When you first open Notifications, you’ll see that mentions, likes, retweets, and follows are all combined into a unified chronological list, which, frankly, I don’t like. Fortunately, you’re not stuck with the combined list. The dropdown menu that’s accessible by clicking on the word ‘Navigation’ in the title bar lets you filter the list so that it includes only Mentions or Activity. By limiting Notifications to Mentions, my Activity is now an extra click away, but that’s fine because it’s not a section I regularly use anyway. When you are in the Direct Message and Search sections, the title bar navigation menu lists your ten most recent direct messages and your first ten saved searches. The navigation menu for the Account, Likes, Muted, and List sections all provide quick access to your profile (a slightly different presentation of the account view), tweets, likes, mutes, and lists. The update also makes it easier navigate multiple accounts. When you click on your avatar, you can click on other accounts you’ve added to Tweetbot to view them in the same window or click on the arrow to the right of the account name to open it in a separate window, which was something that was previously only available as a right-click action. Drag the multi-column button to the right to open additional columns. Tweetbot has also added an interesting new way to open multiple columns. When you mouse over the lower right-hand corner of the window, a bright blue column button animates into view. Dragging the button to the right opens a new column. You can also fling the button to the right in one quick motion to open multiple columns at once. 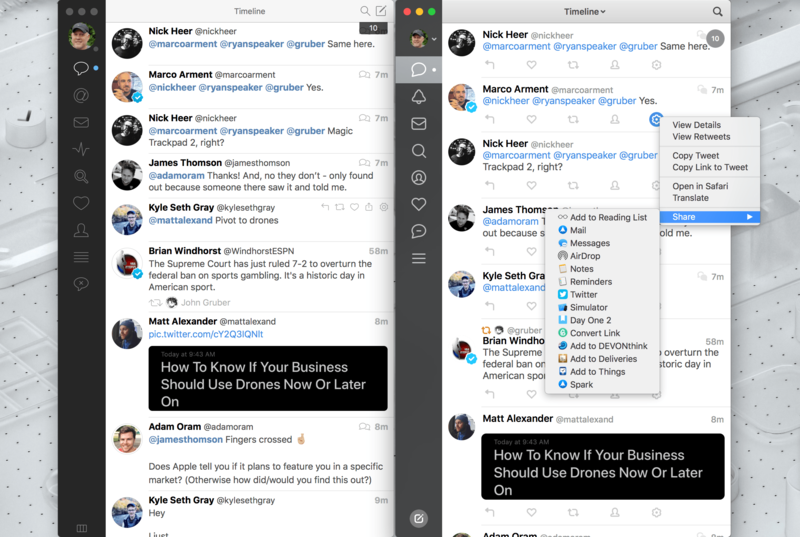 It’s a simple, fast maneuver that’s a big improvement over the old version of Tweetbot. My only reservation about the feature is that it doesn’t always seem to open columns with the sections in the same order. It’s easy to switch to another section using the navigation menu in the title bar, but if the app is going to automatically open different sections for each column, it feels like they ought to follow the order of the sections in the sidebar. There are many other little tweaks to Tweetbot 3 throughout the UI, but there are a couple of things missing too. Support for Favstar, which announced over the weekend that it is shutting down on June 19th, has understandably been removed. So has read-it-later service support. Pocket and Reading List are available as extensions through the Share menu, but the removal means that users of Instapaper, which doesn’t have a Mac app, are out of luck. Tweetbot 3 is an all-new app, which means new and existing users who want to use it will need to purchase the new version. The update provides a solid UI refresh, new ways to customize its look, and greater navigation flexibility. I’m happy with the update, especially the integration of share extensions and new ways to navigate my accounts, but I also don’t feel like any of the changes are must-haves. That said, as an app that I’ve used on my Mac every day for years without paying for an update, I don’t personally have an issue with paying for Tweetbot 3. However, if you’re a light Twitter user and are happy with version 2.5 of Tweetbot, you can stick with it. Tweetbot 2.5 will continue to work, and a bug-fix update is coming. The old version won’t receive new features, but if version 3 doesn’t have features you find compelling, you can wait until it does or until version 2.5 no longer works. 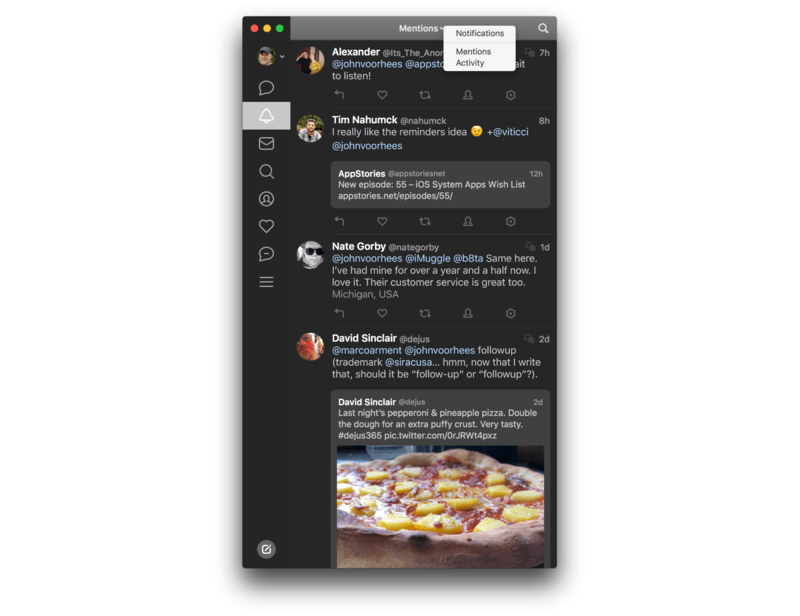 Tweetbot 3 is available on the Mac App Store for $9.99.